I keep running over the phrase 'competitive Resident Evil shooter' in my mind before sighing and returning to work, a look of pain and confusion on my face. There's a new trailer to showcase the joys of mercenary-on-mercenary gunfights with added zombies, and while the trailer looks slick enough (they all have, really) it's such a bizarre fit for the franchise that I can't shake the puzzlement. 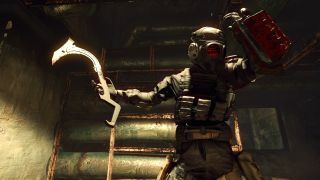 But never mind me—if you relish the though of tactical team-based firefights with a veneer of bio-weaponry gone wrong, you'll be pleased to hear that Umbrella Corps will release in May. Capcom dabbled in co-operative action in the Resi universe with Operation Raccoon City, and it was less than well received, but the publisher is took pains to point out the differences in this faux-shoutcast trailer. Alas, the like-to-dislike ratio does not recommend it. I fear that in this instance the sentiment behind the name 'Umbrella Corps' might have shifted from cleverly generic to unfortunately generic, but I'm open to being surprised come May.